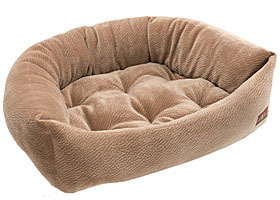 The Jax & Bones Napper Dog Bed is incredibly comfortable and provides hours of deep sleep. Outer bolsters unzip and the center pad is removable for easy washing. This bed is overstuffed with eco-friendly fiber fill. Soft and luxurious, this bed is easy to clean and extremely durable. Each Jax & Bones pet bed is handmade to order in California and is not returnable. Please allow 7-10 days for prior to shipment for your bed to be finished.